Please read the tutorial Getting Started first, if you haven't done it already. This tutorial should introduce you into the basic of adding a block to the game using JSON files. If you want to add a block with functionality you should check out the tutorial for Advanced Blocks. There is a full list of all properties which can be defined inside the json file here. To get started let's create something simple. 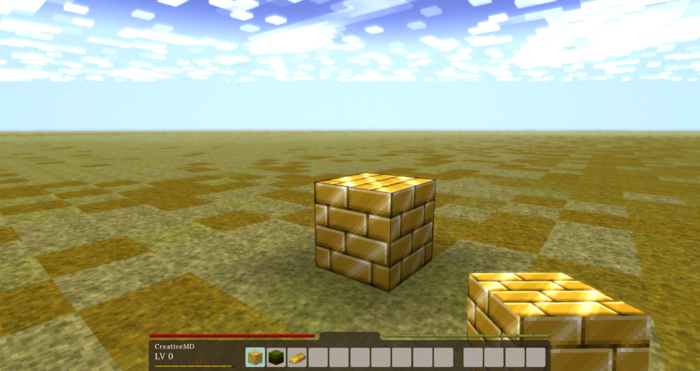 In our example we will add an ordinary gold block to the game (will be for decorative use only). So let's call this mod MyGoldBlock. First of all I suggested to create a new folder to keep everything nice and clean. Inside this workspace we will create the mod itself and later on put it into a zip file, so we can test it and distribute it to other people. 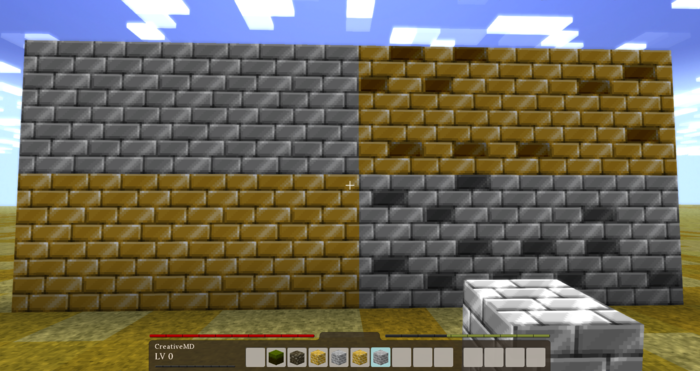 We will use this texture for our block: . Now we need to put the texture at the right place so we can use it later on. Therefore you have to rename the texture to mygoldtexture.png and put it inside assets/mygoldblock/textures/block/ in your workspace (you have to create those folders first). mygoldblock will be our domain. The next thing we are going to need is a json file which will determine the properties of the block. For now we will keep it simple and will work with simple properties only. If you want to do some more advanced stuff you can take a look at the Block Properties Overview. Now you need to create a new json file in your editor (we recommend to use an editor with syntax highlighting, such as Notepad++ or Visual Studio). code: A unique identifier for your block. drawtype: Determines the drawing system, e.g. use 'cube' for normal full cubes or 'json' for custom created shapes. sounds: The sounds to be played when placing/breaking or walking on the block. The prefix game has to be added, since our block has the domain mygoldblock. Otherwise it would try to find those sounds inside our domain. Now save the file in your workspace inside assets/mygoldblock/blocktypes/ and name it mygoldblock.json. The last thing we need to do is to create a zip file of the assets folder inside our workspace. Either you use an external program (such as WinRAR or 7Zip) or you right-click the assets folder and hit Send To -> Compressed (zipped) folder. Eventually you can rename the zip file to MyGoldBlockMod.zip. The zip file can be either used for testing purposes or you can send it to other people so they can use it as well. Furthermore you need to add a modinfo.json file, check out this tutorial. To install the mod, navigate to the Vintagestory folder and place it inside the mods folder. Hint: Use the client command .tfedit if you want to adjust the block position, rotation and scale in Hands, in GUI, when dropped on the ground or in third person mode. Now we do some more advanced stuff with our lovely gold block. We will add random textures, different variants and custom shapes. So let's get started. 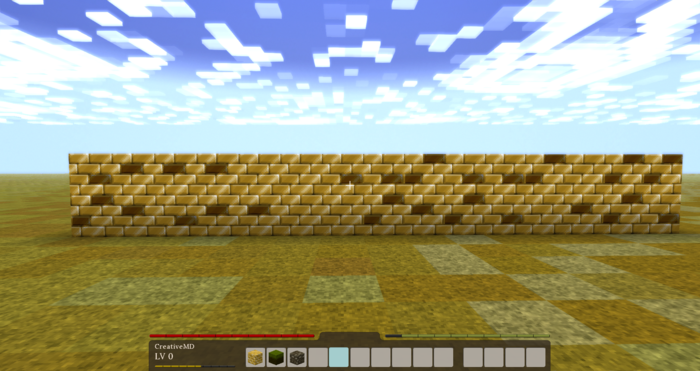 Now we need to add those new textures to the json file. Of course you can add more texture if you would like to. Gold is the best, but iron is awesome too ... so what shall we do? 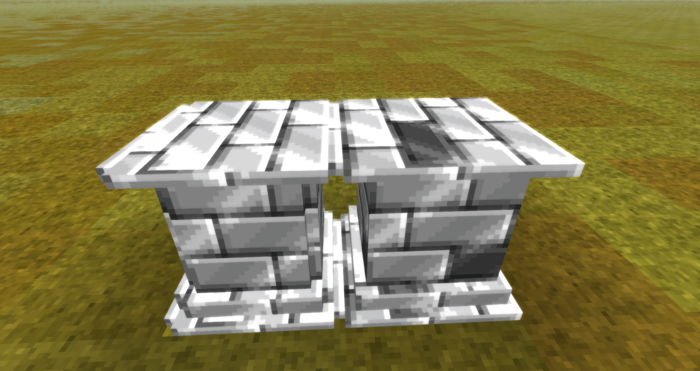 Let's add another variant of this block, because we all love iron. You could duplicate the blocktype file and rename silver to gold in all the places, or you can simply add another variant to the existing blocktype. Now we need to change a few things in our json file. We can add all kinds of different groups, but for now we keep it simple. We are adding group called type, with the states gold and iron. You can use any group code you want. The next thing we need to do is set textures by type. 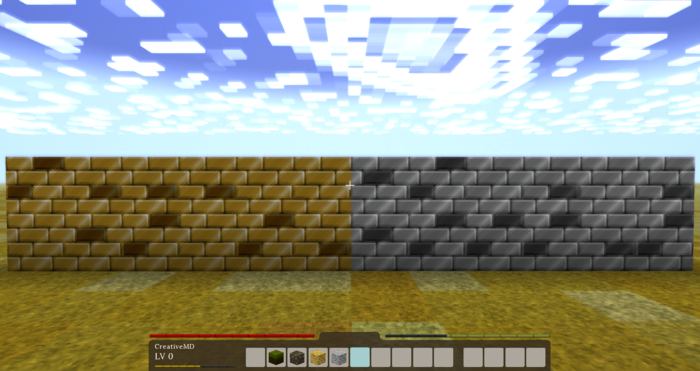 So we remove our texture property and replace it with a new property texturesbytype, which will allow us to set different textures for each type. Every group will be added after each other to the blocks code myblockname-mygroup-mysecondgroup. In our example we can save ourselves writing a few extra letters by using the wild card *. Let's at another group to our block, which will determine the condition of this block. There will be two states good and used. We can add this group by adding another property inside variantgroups. In order to use a custom shape we need to create one first. The engine only supports the model/shape format that's created by the VS Model Creator. Once you have created your own shape you need to export it as a json file, create a new folder assets/myshinyblock/shapes/block/ and save the file in there. In our example we will use this model Myshinymodel.json and move it to assets/myshinyblock/shapes/block/myshinymodel.json. Now we need to specify the model inside our block type json file. Although this would be enough theoretically, we also should determine this block as being non-solid, to prevent graphical glitches. I created another model for the blocks in good condition (myshinymodel1.json), because they should look more awesome, than the ones in used conditions. Therefore we need to copy the json file to assets/myshinyblock/shapes/block/ as well. 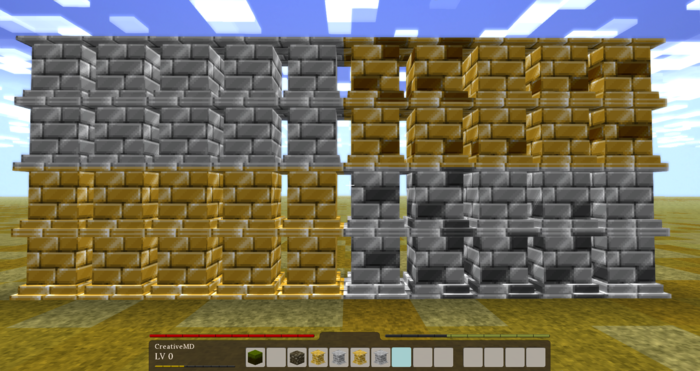 There are a lot of more things you can do with the blocktype and model formats. We recommend you to take a look at the Vintage Story block type files to understand how the system is working, in case something was left unexplained. We hope we could introduce you into the basic of adding blocks the game. Advanced Blocks will teach you how to add more functionality to your block. This page was last modified on 22 April 2019, at 15:48.